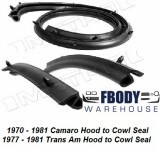 1970 - 1981 Camaro Trans Am HARD TOP Weather Seal Kit Customize to Your Specific Needs! This is a fully customizable weather seal kit for your 1970 – 1981 Camaro / Firebird / Trans Am. The kit begins with a base standard weather stripping kit. The seals are produced by Metro Moulded which is the industry best as per fit, function, and durability. This base kit includes a 15 year replacement warranty. 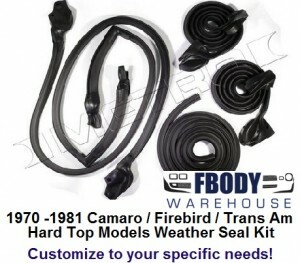 What sets Fbodywarehouse apart from the others is we allow you to build onto your weather seal kit! Use the drop down menus below to go from a simple base kit to a true 100% complete weather seal and gasket kit for your car! When you add on products to this base weather strip package you also get the additional items at a discount for buying together rather than buying everything separately! Look in the video library to see the MANY INSTALLATION VIDEOS we have produced to guide you through an easy and fast installation at home! Camaro Firebird Trans Am with hard top. No Thanks I am all set., Yes add one tube of 3-M Weather Seal Adhiesive. No Thanks I am all Set, Yes add 77-81 T/A Shaker Scoop Weather Seal. No Thanks I am all set., YES Add the forward hood seal 77-81 TA.